FRANCONIA — Not every District 1-AAAA softball game is a pretty one, but when you can get a win to advance to the quarterfinals you’ll take it. Souderton capitalized on mistakes and got contributions from everywhere to pick up a 6-4 second-round victory over Abington Wednesday. Of the six Souderton runs on the day, just two were earned. But the fifth-seeded Big Red is a winning bunch, and they know how to make the most of an opportunity. 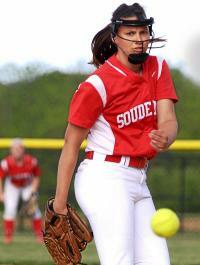 Souderton advances to Friday’s quarterfinals take on 20th-seeded Great Valley, which upset No. 4 Springfield Delco 11-1 in the second round. The Indians have another home game, but they’re certainly not counting themselves in the semifinals just yet. Much like Abington, Souderton wasn’t exactly sharp on this day — which ended up being a weakness Big Red turned into a strength in the win. “We had a couple of errors and we had a couple bad at-bats, but we seemed to be able to wipe them off and forget about them and come back hard. I think that’s the difference,’ Rummel said. Resilience was a theme for both teams in the game. Abington clawed its way back into the game after a Savannah Bostwick two-run single made the score 3-0 in favor of Souderton. The Ghosts got a run in the third and two more in the fourth to tie the game at three. From there it was the home team’s turn to bounce back and take control of the game. 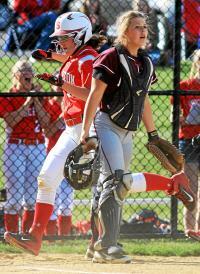 The go-ahead run was scored in the fifth on an RBI single from Katie Kehler, who was in the mix all day offensively. She ended up 1-for-3 with an RBI and a run scored on the day. Two more big insurance runs were scored in the sixth to make the score 6-3 headed into the final frame. Abington got a run in the seventh, but once Souderton grabbed the lead late it never felt like they were going to lose it. That’s thanks to Big Red pitcher Alex Scheeler, who went the full seven innings and allowed just two earned runs. Scheeler allowed only five hits while striking out four. 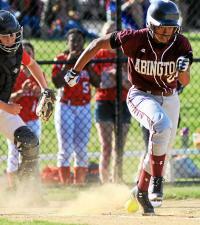 Her counterpart was Abington’s Nikki Ray, who allowed just two earned runs herself in six innings of work. WP: Alex Scheeler 7 IP 5 H 4 R 2 ER 0 BB 4 SO 1 HB. LP: Nikki Ray 6 IP 10H 6R 2ER 2BB 1 SO. Abington: Washington 2-4, RBI, R; Worek 1-2, RBI, R; Sowell 0-3, RBI, R, HBP; McNally 1-3, RBI; Malfera 0-4, R.
Souderton: Bostwick 1-3, RBI, R; Kehler 1-3, RBI, R; Shelly 2-3, R; Gaydos 1-1, R; Yoder 2-4, R.